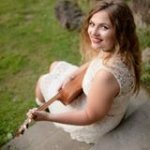 I think I've done enough violin blogs, so how about my other instrument? That's right, ukulele. And yes, I actually play it, I don't carry it around like an accessory and pretend like I know how to play. Like the violin, the ukulele is a string instrument, so the sound comes from vibrating strings. Unlike a guitar or violin, the strings of a ukulele are made of nylon, which gives it that distinct ukulele sound. Both the length and the tension of the string determine what note it plays. When tuning, if the string is flat, you tighten it to tune it. This increases the tension and frequency. If it's sharp, loosen the string. How loud the ukulele is depends on how hard you strum. The harder you strum, the higher the amplitude of the vibrating strings, resulting in higher volume. The noise also comes from the sound of the vibrating strings echoing in the hollow chamber in the body of the ukulele. If there were no chamber, the ukulele would not produce much sound. 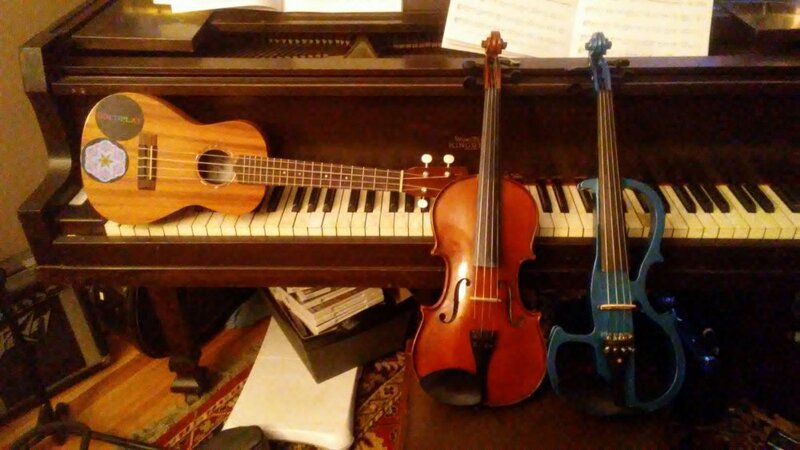 Enjoy this picture of my ukulele with my violins on top of a piano. I'm bad at piano by the way.